As the rollout for the Blended Retirement System implementation continues, amplifying details continue to be released for some of the specifics of BRS implementation. On January 27th of this year, DoD released the policy memorandum that will implement BRS guidance including some of the major updates from the 2017 NDAA that modified some of the original plan of the BRS as outlined in the 2016 NDAA. You can read the entire 31 page Blended Retirement System implementation memo here, but I’ve summarized the key changes, updates, and implementation details below. If you haven’t studied much about the BRS before this, you should go read this post first as it explains the basic details before coming back to read the updates below. Continuation Pay can now be given anywhere from the 8 – 12 year point in a servicemember’s career instead of the original time of only 12 years. The determination of when a servicemember can receive Continuation Pay is determined by their Service Secretary. Upon receiving Continuation Pay, the servicemember is now only obligated to serve a minimum of 3 years, instead of the original 4 years. If a servicemember received Continuation Pay, but fails to complete period of obligated service he or she will be required to repay either the full or partial repayment. While all situations are unique, Continuation Pay may be subject to repayment of a pro-rated amount dependent upon why the servicemember did not complete their obligation; similar to other bonuses paid today (for example the retention bonus). The Career Status Bonus (CSB) will no longer be an option after 31 Dec 2017. This one-time $30,000 CSB payment is currently offered to active duty members upon completion of 15 years of creditable service in exchange for both an agreement to continue serving to at least 20 years and a subsequent reduction in that member’s retired pay multiplier for each year less than 30 years that the member serves. CSB was always a terrible option and no one should ever take this as the reduction of retirement pay made the math always work against the retiree. For individuals that are unable to enroll in BRS due to a case of hardship, their respective Service Secretary will have the authority to adjudicate those requests and/or determine eligibility for extensions of the enrollment period. There will be no “early” enrollment into BRS. The first possible opportunity to enroll will be on 1 Jan 2018. The Army, Navy and Air Force enrollees will make the selection in DFAS on the “myPay” website while Marines, the Coast Guard, USPHS, and NOAA will enroll via procedures to be provided later on by their respective Secretary. Any midshipman/cadet attending one of the Service Academies or under contract in ROTC as of 31 Dec 2017 who has signed an agreement to serve as a commissioned officer in a Uniformed Service upon graduation, will remain grandfathered into the High-3 retirement system, but will also be eligible to enroll in the new BRS. 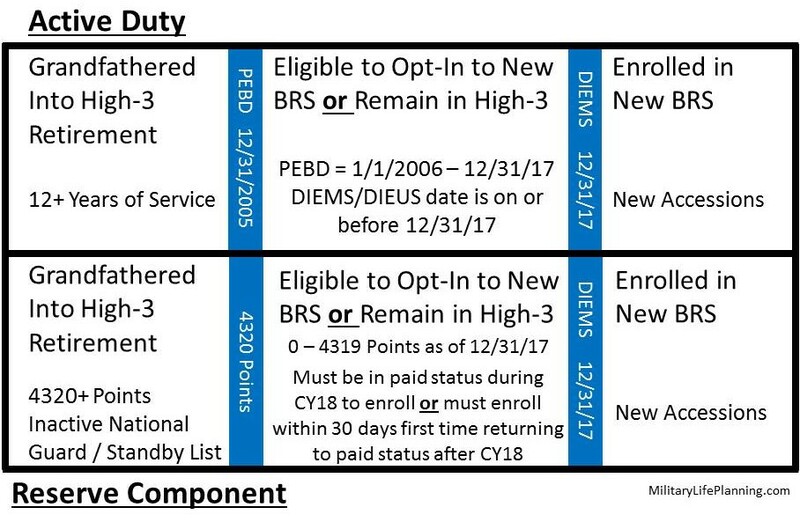 Except for those commissioning during 2018 who have all of CY18 to enroll, the others will have 30 days from the first day of entering active duty in which to elect to enroll in BRS otherwise they will remain grandfathered in the High-3 system for the remainder of their military career. Servicemembers who were placed on the Temporary Disability Retired List (TDRL), but are later determined fit for duty and reenter active service are eligible to enroll in the BRS provided they meet the other conditions just as if they had never left active duty. By my estimates, the discount rate calculated as of Jan 2017 would be approximately 7.3% (3.02% + 4.28%). The OSD office of the actuary’s figure will differ based on when they calculate the rate. For servicemembers that enroll in the BRS and are given a disability retirement, their retirement multiplier will be 2% just as it would be for their regular retirement calculation. Just as is currently in effect however, the servicemember may choose to receive retired pay equal to their retired base pay multiplied by the member’s rated percent of disability. Due to the prohibition against duplication of benefits if a disabled retiree chooses to receive the lump sum option, the VA will withhold disability payments until the amount withheld (i.e., not paid to the retiree on a monthly basis) equals the gross amount of the lump sum payment received by that retiree. Servicemembers who are retired for a physical disability for Concurrent Retirement and Disability Payment (CRDP) due to a service-connected disability rating of 50 percent or more are not subject to withholding of VA disability compensation. A retiree who would otherwise be eligible for Combat-Related Special Compensation (CRSC) will still require a waiver of retired pay before a retiree can receive VA disability compensation. Further guidance of this policy will be addressed in a subsequent memorandum to be issued by the USD (P&R). Servicemembers who decide to enroll in the BRS but already have a TSP account will be required to reaffirm their TSP individual contribution percentage once they make the BRS election. No prior TSP contributions will be matched. New accessions into a Uniformed Service on or after January 1, 2018, will be automatically enrolled in TSP at the level of a 3 percent individual contribution. The servicemember has the option at that time to modify the default TSP contribution to whatever they desire. Servicemembers who decline the automatic enrollment of 3% and have a 0% TSP contribution rate in December will be automatically re-enrolled January 1st at the 3% contribution rate again. The servicemember may continue to decline the auto enrollment every year. The default type of individual TSP contributions will be in the Traditional TSP as tax-deferred contributions. Servicemembers may change this default selection to the Roth TSP option in myPay at any time. All of the government automatic and matching contributions will always be tax-deferred “traditional” contributions. Unlike the current default TSP investment into the G fund, BRS enrollees will be automatically invested in the most age-appropriated Lifecycle fund. For most young servicemembers today, this will be the L-2050 fund. No matching TSP contributions will be made once the servicemember completes 26 years of service. While we now know a bit more about some of the finer details of the Blended Retirement System implementation, there are still some questions to be addressed. Take advantage of your base Personal Financial Counselors who offer free education and individual one-on-one training and assistance to understand these concepts. The DoD will soon also be rolling out some major education initiatives to help address financial literacy among servicemembers. The DoD is also scheduled to release the official BRS calculator where servicemembers can compare their options for switching to the BRS or staying in the high-3 legacy system. I’ll continue to work to analyze and evaluate all BRS updates and news to help keep you informed. Let me know what questions you may have! DIEMS or DIEUS: Date an individual was initially enlisted, inducted, or appointed in a regular or reserve component of a Uniformed Service as a commissioned officer, warrant officer, or enlisted member. For cadets/midshipmen at one of the Military Service Academies, it is the date of entry into the academy; for ROTC cadets/midshipmen it is the date of scholarship contract or date the cadet/midshipman began the advanced ROTC course, whichever is earlier; and for members of the delayed entry program it is the date an enlistment contract is signed, regardless of when the member actually enters active duty. Breaks in service do not affect a DIEMS/DIEUS date. Hi, I also posted this comment on paycheck-chronicles.military.com since you shared the article there, but wanted to comment here as well in case you didn’t see it. I have searched EVERYWHERE online for an answer to this and cannot find one. I plan to enroll in BRS as I don’t currently forsee a full 20 year career. I am active duty (O2) and was recently at a briefing by an O6 Personnelist, and he mentioned that military who have a date of separation when they opt into the BRS will NOT receive matching TSP contributions (he said since they’re about to separate within the next year or two). I couldn’t tell if he meant never receive them, or stop receiving them within a certain timeframe of the date of separation. Is this true? He said it is more directed to enlisted, and since I’m an officer I don’t need to worry about it if I don’t have a date of separation yet (which I don’t). But I can’t find any info about this in any of the handouts or trainings and want to be able to honestly answer my airmen about it. And in the event I were to turn down an assignment before December of 2017, and thus have a date of separation for early-2019, would I not receive some (or any) TSP matching under the BRS since I will have a date of separation when I enroll in January 2018? Also, say I opt in and do not have a date of separation scheduled yet. But then in a year, in 2019, I turn down my next assignment and thus have a date of separation. Will I continue to receive matching TSP contributions until I separate? Or will they stop within a year or two of that date of separation? I got the official answer from the DoD which lined up with what I expected. Everyone who enrolls in the BRS will receive matching contributions until they actually separate. Please feel free to follow up with more questions! I served 8 years in the Army on Active Duty from 2000-2008 and about 8 years in the National Guard from 2008-2016, before transferring to the IRR due to civilian career commitments. I believe I’m in the less than 4320 points category. I’m hoping I can get some retirement benefit without having to return to 4 more years of drill. Can you explain my options at this point? I’d love to help you out so send me an email (daniel@militarylifeplanning.com) for a more in-depth conversation. The short answer though is as long as your stay in the IRR you won’t get any retirement benefits either towards the traditional pension as even though you’re earning points you aren’t getting credit for good years. Unless you come onto paid status in the Guard or Reserves in 2018 to enroll in the BRS, you also won’t be eligible for automatic government and matching BRS contributions.